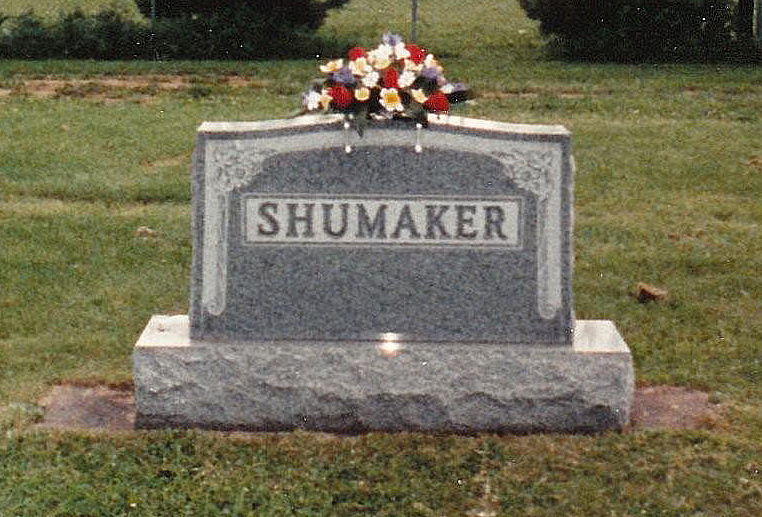 Charles SCHUMAKER was born on 20 Jul 1872 on his parents' farm. The Schumaker farm in Crawford Twp, Coshocton County, about two and a half miles south of Baltic, Ohio in what was known as "der Gleitz" or "the Glades" (SR 93) area. He was the thirteenth child of the sixteen children of William and Margaretha Wentz Schumacher. He was at times called by his nickname, "Joe." Charles, age 15, was Confirmed on April 15, 1888 at St. Peter's (aka Gonter's or Lint/Fiat) German Lutheran Church by Dr. Gustav Dolch. Confirmed the same day was Rosena Meitzler, age 13, daughter of Lewis and Mary (Miller) Meitzler whose farm was also in "Der Gleitz" vicinity; the families were neighbors. Among the founders of St. Peter's were Wilhelm Schumacher, the Immigrant, grandfather of Charles and Peter Miller, great grandfather of Rosena. On November 28, 1894, Charles and Rosena were married by Rev. Smith of the German Reformed Church and began their married life in Crawford Twp on "Der Gleitz" Road not far from both the Schumaker and Meitzler farms. They were both educated in the one room schoolhouse at Halifax in very close walking distance of both their homes. The whole community in area were German and spoke German, at home and at church. You still hear the German language spoken by Amish and others in the area and the accent of even second, third and fourth generations in that area is still delightfully tinged with it. Rosena "Rose" MEITZLER, daughter of Lewis MEITZLER and Mary MILLER, was born on 24 Sep 1874 at Halifax, Crawford twp, Coshocton Co, Ohio on the farm bought by her great grandfather, Charles "Karl" Meitzler. She was named for her maternal grandmother, Rosena Schneider Miller. Rosena Meitzler appeared the census in 1880 in Crawford Twp, Coshocton Co, Ohio, six years of age, living with her parents, Louis and Mary Miller Meitzler. They had just built a big new home on the property and Lewis and Mary and their family lived there. On the same property were her grandfather, Karl or Charles Meitzler and her step-grandmother, Elizabeth. They lived in the little log cabin that Charles had built for him and Lewis when he first purchased the farm. Lewis was in his teens at the time and his father, Charles had not yet remarried. The 1899 Coshocton County Directory records that Charles Schumaker was a farmer in Crawford Twp, Coshocton County, Ohio. He is pictured on top of a wagon in the picture entitled "The Halifax Bunch"; he is the one with the dog. Three daughters were born to Charles and Rosena in their little house still standing on (now) SR 93 between Baltic and Pearl; Vesta Viola (1895), Bernice Eva (1897) and Beatrice Orilla (1902). The little family appeared in the census in 1900 in Crawford Twp, Coshocton Co, Ohio. They lived next door to Jacob and Caroline Schumacher Gass and four houses from Rosina's parents, Lewis and Mary Meitzler. Grandmother was doing the washing on the washboard, heating the water on the stove and carrying it, when her labor pains started that May 26, 1902. She finished the washing, carried the water out and dumped it, cleaned her tubs and put them away and put a pot of soup on the wood stove to cook for supper; in the early evening she had Baby Beatrice. Charles took the furniture down, built a log cabin on the land and Rosena followed sometime later on the train with the three girls. Mother used to tell that she was a chubby little five-year-old, and took her little purse up and down the aisles of the train and sang "Good Bye My Lover Good Bye." She didn't speak English and the words came out "Goodbye My LIVER Goodbye"; she got many smiles and pennies for her little purse. In Alabama in 1908 the fourth daughter, Maria Margaretha, named for both her grandmothers, Maria Miller Meitzler and Margaretha Wentz Schumaker, was born. SHUMACHER, Charles, Head, Age 37, Married 16 years, House Carpenter, Owns Home Free, born OH, Father/Mother born Germany. The girls picked cotton to earn some money; Bernice and Beatrice bought themselves little parasols with their money once. Charles was a Carpenter by trade, and he built a two story frame house for the family, the first one in the area. People would always want to go upstairs and look out the windows. Charles and Rosena raised a truck patch and their mother would take produce and eggs to town in the buckwagon, and sell it to customers and return home with supplies. She left the older children to do the housework and weed the garden. They would get up on the tin roof of the old log cabin and put maple syrup and sugar candies, drying them in the sun. They could see the buckboard across the fields when Rosena crossed the railroad tracks and they would hurry down and quickly do their chores before she pulled into the barnlot. In December of 1914 Charles got soaked in a cold rain that flooded the property. He pushed Rosena's wash tubs to the barn to feed and soon he had pneumonia. He died on December 7th at age 42 or respiratory problems at his homestead near Pine Grove. He was buried in Baldwin County. The love of Rosena's life was gone and she never remarried, but she had six children to clothe and feed and raise. Baby Victor was only four months old when his father died; Vesta was 17 and ever frail suffering from tuberculosis at one time and from chronic bronchitis at all times. The family up north wanted them to come back up where they cold help to raise the children and "do for them all." And so she stiffened her spine and moved forward; but she nor the girls never stopped looking back at happier times. I never tired of hearing the stories of my mother and her sisters growing up in the south and they never tired of telling them. Those were cherished times for them and vicariously for me. In the 40s and 50s we were still singing the old songs of the south. They still kept in touch with some of the old friends from Baldwin County as long as they lived. Some of them came to visit so I met some of the people of the "tales of the south." Rosena sold the Homestead and came back to Coshocton. She and the family lived with Charles' brother, Will Schumaker and his wife Minnie Schlarb Schumaker while provision was made for a piece of land and Will and another brother Henry built her a good solid 4 bedroom house in 1915 at the top of East Elm Street hill. That house at 1419 East Elm Street was the family home until the 1950s. (I have the papers where she bought the lot she built on from Heskets for $1.00). But I'm getting ahead of the story. Rosena raised a garden that took up half of the back yard. We picked blackberries on top of the hill that is now covered with houses. The farmers of the family would bring a quarter of a beef and pork in the fall and the canning kitchen in the basement was ahum with family helping to cold pack the meat. There were shelves built on both sides of the basement that were full of canned fruits and vegetables. The work ethic was strong in Rosena and her children. When the house was first built there was no furniture and they told about sitting on orange crates around a table in the basement to eat their meals. Once there was only an apple and grandma cut it in enough pieces for the children and turned her back and went about her work. Pictures of her at that time show her very thin. Bernice and Beatrice went to work in the Glove factory to help out. Margaretha, Karl and Victor went on to college with their help. Margaretha went to Kent State and became a teacher and Karl and Vic were graduates of Ohio State in engineering. Vic made his career in the Army. Karl went to Massachussets and then to the Akron, Ohio area and worked for Adamson United. The Depression came and Beatrice and Bernice found work in Richmond, Indiana at the Glove factory there and were gone from Coshocton for a number of years. And that's where I come into the story. Beatrice and Bernice roomed with Grace Leas,widow of Roy Leas. Her brother-in-law, Bill Leas picked them all up and dropped them off at work on his way to the bank where he worked. Grace and Bill introduced mother to their brother, Guy Leas and they were married January 28, 1939 with another brother Edwin and his wife Mary Jo, standing up with them. It was a close knit family and they socialized with their siblings. I, Rosalie Kathryn Leas, was born on June 27, 1939 at Reid Memorial Hospital in Richmond. Dad was in construction and we moved about often. In 1942 Dad was in the Army and Mother and I came to live at Grandma's - 1419 East Elm Street in Coshocton. I was three and a half when my parents divorced. So I grew up at Grandma's with the work ethic, the delightful tales of the south, opera on Saturday afternoons and Sunday School and Church on Sundays. Aunt Vesta was into efficiency and she kept us all working toward greater efficiency. Aunt Margy was a teacher and she edited everything that came from our mouths so that we learned to speak "good." We had no car so it was like a parade of ducks coming out of the house in ones, twos and threes, all dressed to the nines and trapsing down to St. John's Evangelical and Reformed Church at Eighth and Orange Streets. Grandma Rosena worked hard all the years that I lived with her. She put in her garden when she was 79; the next year the girls thought it was too much for her and she sat on the back porch and watched others making garden and cried. She spoke broken English as her family spoke German at home and her children learned English when they went to school. She vass delightful; I loved to hear her talk. I would sit in the open stairway and listen when she talked on the phone to her sisters, Elizabeth Meitzler (Mrs. Jacob)McQueen, Laura Belle Meitzler (Mrs. Luther) Doak, and Edith Meitzler (Harry) Degen. I learned to know much of the family of both Rosena and Charles. In fact, some of our family were founders of St. John's and when we had a covered dish supper it was a virtual family reunion. I felt very much at home there surrounded by Aunts and Uncles, Great aunts and uncles, and cousins of all stripes. Rosena and her children were present at most of the reunions of the Lewis and Mary Miller Meitzler family over the years. The minutes of those meetings is in the collection of her granddaughter, the writer of this piece. Grandmother developed what was then called "hardening of the arteries" - probably now would be diagnosed as Altzheimers. She got so she would use any minute she could find to wonder off and head (always in the right direction) for "Der Gleitz" and the old Meitzler home. She got frail and it was necessary to hospitalize her. At that time that meant Cambridge. She had been there three weeks when a Western Union Telegram dated July 16, 1958 arrived addressed to Miss Vesta Schumaker: "ROSENA SHUMAKER IS CRITICALLY ILL AT THIS HOSPITAL." She died the next day. Funeral services were held at St. John's Evangelical and Reformed Church; Rev. W. Osborne Keeler officiated. She had been a member of the CIC Class (Comrades in Christ) and the Women's Guild of the church as well. She is buried at South Lawn Cemetery along with her daughters. She left three grandchildren, Rosalie Kathryn Leas (the writer of this bio) (d/o Beatrice), Ada Marie Shumaker (d/o Karl) and Charles Justin Shumaker (s/o Victor). What I want to leave my readers with is that my Grandmother, Rosena Meitzler Schumaker was a strong and courageous woman who did what she had to do whatever it took. She was, and still is, an inspiration to me. She was a hard worker and at the same time a very kind and gentle lady who taught me to take small steps when I walked and to polka (around the dining room table). She was a woman of high morals and of dignity, even on her hands and knees in the garden. She bought me my first Bible when I was confirmed and I still have it but in a box because I wore it out as she did hers. I thank God she was my Mother's Mother and My Grandmother and guide in my growing-up years, and still a hero of mine as I move into my 70s.